Two years ago I was diagnosed with the “Good” cancer. Everyone including the doctors all assured me that if you have to have cancer at least it is the “Good” one. I quickly found out that I wanted to punch anyone that said that to me. Yes, I agree it is not as bad as most. I have watched my mom go through 5 different ones, and took care of both my Gramma and Sister as they struggled and eventually passed from thiers. So I GET it, Thyroid cancer is the better of them to have. But, I am here to tell you there is NO good cancer. I started out optimistic, have surgery then get radiation and you’ll be fine they said. 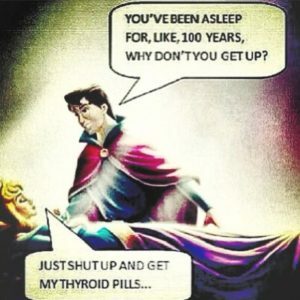 You don’t need a thyroid, a pill a day will suffice. Yeah, NO! First surgery paralyzed my vocal chord, took me months to get back my voice. But hey nobody needs to talk or breath, right? And believe me, you will quickly think, “this is NOT GOOD” when your doctor in full protective gear opens a metal canister, uses long tongs to hand you a vile with a pill, and tells you to swallow it as he is backing out of the room. But that was the easy part. A pill a day? For those that don’t know what a thyroid does, let me sum it up for you…EVERYTHING! I spent the first year pretty much freezing and sleeping 20 hours a day, as no thyroid hormones mean no energy and no temperature control. Being in Florida I should like the freezing part right? Nope, go out in the heat and I quickly got overheated as it doesn’t tell your body to cool you off either. Has taken two years and four different medications to finally find one that has me on the right track to feeling normal. But at least during part of it, I thought I was cancer free. Unfortunately on my checkup last December that proved to not be the case. They found I was one of the lucky ones to have the recurrent “good” cancer. So back into surgery, a triple dose of radiation, and staying off my medication through it all. Radiation does have its own issues, so honestly, I was kind of looking forward to being sleepy again. The lovely receptionist at MD Anderson even told me to think of quarantine as a vacation, lol. The second surgery was more difficult and I ended up having two surgeons as they also decided while they were in there trying to take out the cancer, they would try to repair my vocal chord. So again, talking became an issue. Which brings us to now, two years later, still can not say cancer free although I am hopeful that my upcoming test in September will prove that I am. Back on my thyroid medication, which is helping me only sleep about 12 -14 hours a day and is finally helping get my vitamin levels stabilized. looking forward to speech therapy to strengthen my voice, and all just in time to realize how bad everything else in my life got while I was sleeping the days away. Even with insurance, the costs added up quick. I have paid what I can, put off what I could, and am now trying to focus on getting this to go away so that I can put this all behind me (fingers crossed) and get back to life. I am ready to purge the past and simply LIVE!